After years of waiting and careful selection, bubbly actress Toni Gonzaga's picky nature proved to be no match to the charms of handsome director Paul Soriano. We Filipinos are incorrigible romantics. That may sound like a worn-out stereotype in defining ourselves. But how else explain our undying fondness for sentimental music, movies about love and happy endings, and, of course, showbiz lovers? The subject of love never fails to tickle entertainment reporters' collective fancy. No matter how many questions or issues arise in presscons, they always revert to the tried and tested—"How's your love life?" "Totoo bang break na kayo ni...?" "Kayo na ba ni..."
Such curiosity only reflects what the fans and readers have in mind, of course. Anything that has to do with romantic love—either reel or, most interestingly, real—always makes good copy. For this Month of Love, PEP [Philippine Entertainment Portal] looks back to 2007 and uncovers three heart-warming romantic tales: Finding the One, Love...Second Time Around, and Love A-blooming. TONI MEETS HER MATCH. Toni Gonzaga weathered the initial bumps that met her at the gates of ABS-CBN before her career took an upswing. She became a Kapamilya regular. Soon enough, gorgeous actors were being associated with her—Piolo Pascual, Sam Milby and Luis Manzano, among others, enough to drive any woman green with envy. But Toni didn't succumb. She swore, we're "good friends." Toni's love life was peppered with speculations and, for a time, even her gender preference came into question. While all the whispers and rumors kept buzzing, Toni's heart, unbeknownst to many, was starting to sing a tune for someone by the name of Paul Soriano, grandson of the late actor Nestor de Villa. "He is actually very nice and every inch a gentleman," said Toni during a press conference last July 2007. She rarely opens her heart and thoughts to the public when it comes to her love life. But Toni hinted that, indeed, something special was going on between her and the good-looking director. "You cannot really stop it if it comes. It will be so hard to suppress any kind of feeling, especially love, because it is such a beautiful emotion," she acknowledged. Paul directed Toni's music video for her first single, included in her second album, Falling In Love, which was released last year. The song's title perfectly conveyed Toni's budding feelings at the time, "Catch Me I'm Falling." BACK FOR GOOD. 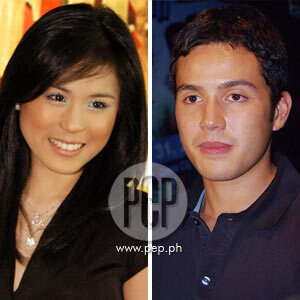 Isabel Oli and Paolo Contis had to go their separate ways to find each other anew. Although they were often billed in a number of GMA-7 programs, it was only in 2005, when they worked together in Sugo, that love blossomed between the two young stars. Unfortunately, the two had to severe ties when their respective faiths clashed. They remained close friends and refused to speak ill about each other during separate interviews. Paolo even labeled their separation back then as a "cool off," mainly because they still kept in touch despite the split. Last year, June 25, during the press conference of GMA-7's Mga Mata ni Anghelita, many were confused by their apparent intimacy. Some onlookers assumed they were together again. But Paolo denied this and insisted, "Ayoko namang tawaging reconciliation dahil hindi naman kami nag-split up formally." He explained, rather ambiguously, "Ayoko ring kami na nga ulit, pero parang ganoon na rin, wala lang committment. Nakaka-pressure naman kasi talaga ang commitment. "Noong kami, dapat kailangan pumunta ako sa bahay niya para bisitahin siya. Ngayon, ako na talaga ang may gustong pumunta sa bahay niya kasi gusto ko siyang bisitahin. Ako na ang nangungulit sa kanya, ‘Hoy, punta ako sa inyo ha.'" He rationalized their renewed closeness: "Wala naman akong dini-date na iba. Wala rin siya." Months later, the two openly announced that they were back together as a couple. Isabel said, endearingly: "Naramdaman ko ‘yon, sincere siya sa lahat and hindi siya plastic, and mabait siya. Hindi ko alam kung bakit love ko siya, hindi ko talaga alam, hindi ko ma-explain, pero sana siya na talaga." "Siyempre nakakatuwa, kasi konti na lang yung mga seryoso, e," she smiled. "Alam mo ‘yung ganun? Na gusto talaga nila ng commitment, konti na lang yung mga lalaking ganun." As for Paolo, one only needs to hear how he calls Isabel before his friends—"My future wife." BUDDING LOVE. 2007 marked the transformation of Shaina Magdayao from a teenybopper star to a more sophisticated version of herself. Gracing magazine covers left and right, plus endorsement deals to boot, the younger sister of Vina Morales certainly was deadset in projecting her new image. Like a flower in bloom, Shaina started to attract male attention. First on the list was Rayver Cruz, who was very vocal in admitting his admiration for the pretty actress. But just when everyone had their sights focused on Rayver, young actor-dancer John Prats suddenly entered the picture, blurring the entire scene. Rayver raised the white flag, giving way to Shaina's new suitor. "Nagulat din ako," gushed John to PEP [Philippine Entertainment Portal] contributor Dinno Erece in an interview last November 6. "Matagal ko na siyang kilala, kasama pa siya ni Camille [John's sister], so I saw her grow up... Never kong plinano na ligawan siya, dumating na lang isang araw." John also clarified that he and Shaina never had the chance to go out alone on dates. It's always a group date, he said. Obviously smitten beyond his wits, John blushingly confided how excited he was about possibly being Shaina's first-ever boyfriend, "If ever kami, I will not deny, hindi ko ikakahiya." Although Sahina has decided to take on a mature persona, she still prefers old-fashioned courtship. She said of John's scheduled house visits: "May oras po ang dalaw ni John, hanggang two hours lang ang pinakamatagal at dumarating po siya after dinner. Pero hindi po naman siya laging nakakadalaw dahil lagi rin akong wala sa bahay."